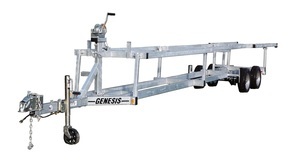 New Trailers - Northern Boat Wholesalers Inc.
We offer a full line of Genesis Trailers. outside of the trailer frame. This helps in protecting the trailer longer from rust erosion caused by dirt, road salt, and repeated fresh and saltwater immersions. Their line-up includes kayak/canoe trailers, single and double pwc trailers, small boat trailers and pontoon trailers. Genesis Trailers is a family-owned business based in Holland, MI. Every new Genesis Trailer is compliant to Transport Canada requirements and are ready to roll. 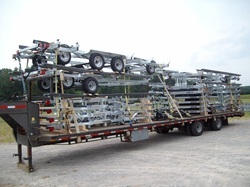 OUR TRAILERS ARE ALL GALVANIZED FOR THE SAME PRICE AS MOST OFFER PAINTED MODELS FOR ( $250-$400 option ). FREE 100km DELIVERY ON ALL NEW PONTOON TRAILERS!